To drive through the bog when the light is falling upon it can be wonderful. You can see shifting shadows of chocolate browns and purples and light-filled gold and sienna grasses. The road passes through the rolling hills of the stark landscape. This painting is a memory of the west where bog sweeps down to ocean. The painting resulted in a series of opposites that still bear relationship to each other to create a visual whole, almost yin and yang like. The cool blue sky and cloud are painted with a large brush in broad expansive strokes, in a sweeping and swirling motion, to capture the ephemeral quality of light and shifting form. The cloud hovers above us for a second, moves from left to right and then, the blustery wind of the west will take it on its way. Below,in the dense bog and rounded hills, the paint is applied in thick globs with a large palette knife that cuts into the land, shaping form. It’s like a slean that’s used to cut turf, slicing and sliding through the dark chocolate bog, till it too leaves its mark. When I was painting the bog and hills, butter came to mind. I have a recollection of people finding slabs of butter buried in the bog millennia ago, either as a way to preserve it or as an offering to the gods. The paint was like butter, swathed across the canvas and built up in rich textures and contours. I’d love to hear what you think of the painting. ‘The Bog Road’ reminds me of a trip across the bogland of Connemara. 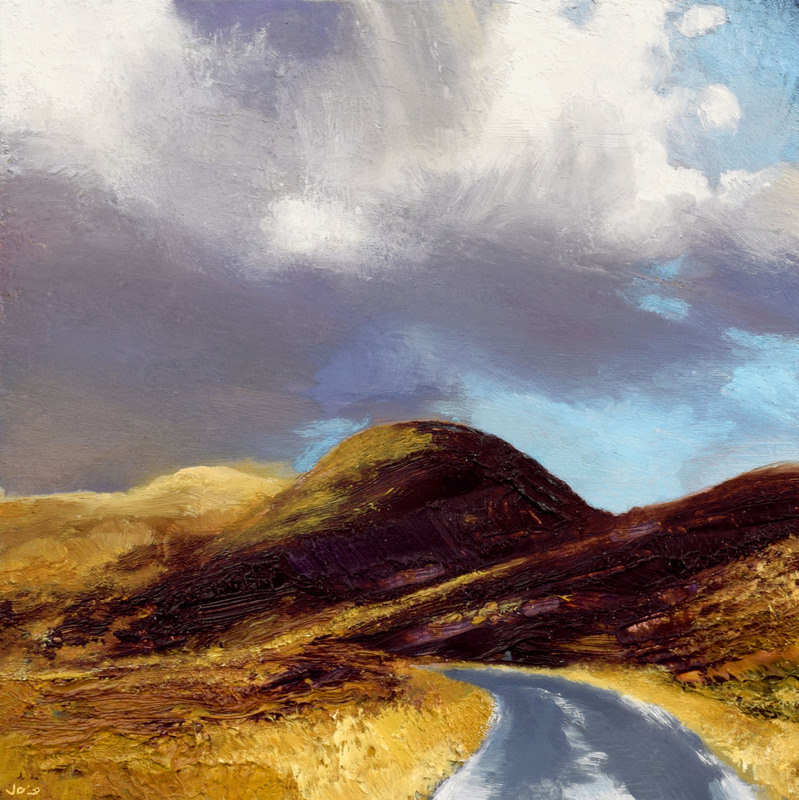 The roads were often empty and felt remote and yet the changing weather brought the landscape to life with a show of endless colour combinations: violets, deep reds, dark chocolate, gold grasses… Your painting captures the mood and the essence of that special place. Thank you for your comment. Glad to hear that it reminded you of Connemara, as you say it is ’empty and remote’ and the painting captures the essence of place for you. This painting intrigues and interests me as does your commentary John and the whole notion of bog butter is new to me – fascinating! It is a visual treat in the richness of the colours (I love that burnished gold) and the wonderful contrasts you have created; the texture is beguiling in itself. The blue/grey of the sky, so full of movement is mirrored in the path which takes us on a journey through the hills.